In one of the more visually arresting pieces, dancers throw sand in the air that extends their movements, in the restaging of "Electric Blue" by the IONA Contemporary Dance Theatre. Water, water everywhere, and not a drop ... on stage at the Hawaii Theatre. There was plenty of sand, though, gracefully (if with some force) tossed about in a rehearsal last week of IONA Contemporary Dance Theatre's restaging of the H2O-inspired "Electric Blue." Up to 10 tons of the sterilized stuff was purchased from the mainland and is now contained within a boxed-in area. 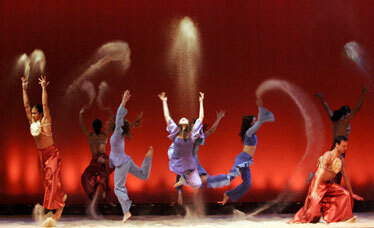 All 12 dancers use the sand as a naturalistic dance floor, as well as fling handfuls of it in eye-catching arches. While it's inevitable that a dancer or even someone in the first few rows of the audience will get a stray grain or two on their person, the company does take one precaution -- ear plugs -- while gamboling in their grown-up sandbox. The water present on stage will be confined to a video-screen projection. Ocean videographer Mike May shot the dancers underwater, and their movements will help illustrate artistic director-choreographer Cheryl Flaharty's cosmic vision of nature's basic element in relation to us and everything in general. It's a lofty sentiment that originated, on a more mundane level, with the color of her Dodge PT Cruiser. "That color of electric blue started the whole intuitive discussion of what water and the ocean mean to our environment, especially here in Hawaii," Flaharty said. "It's also the relationship of water with the sky as it ties to the universe. "We start our piece with ancient myths based on the Scottish selkies -- seals that can take on human form and revert back -- and Ulysses in 'The Odyssey,' and end it with something we made up." The premise is that water is everywhere -- even in the reaches of outer space in the form of ice crystals -- and inside everything. "Water is a life force, and I think people don't realize that our availability of fresh water is being threatened by pollution. ... But we have a funny piece that shows the different varieties of water you can purchase in the grocery store nowadays." 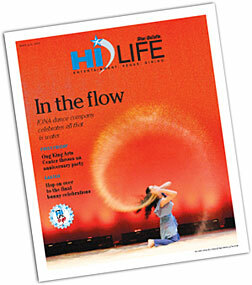 Flaharty finds inspiration everywhere to infuse her artistic vision, choreography and dancers. Ever since IONA's origins in 1992 with the groundbreaking "The Mythology of Angels," Flaharty has staged her major works two years in a row. With this second go-round of "Electric Blue," half the company is new, and Flaharty is happy to be working again in the refurbished downtown institution of the Hawaii Theater. "Doing dances like this is a challenge, because they're not meant for small (performance spaces), but a proscenium theater like here," she said. IONA will take "Electric Blue" on a seven-show California tour later this month. They'll also do a specially adapted version at Kalapaki Beach on Kauai on April 15. Since "fiddling with it" after last year's debut, Flaharty states, "I think the work is stronger and more powerful. I changed the music and added the sand-throwing in that piece we were rehearsing. And my aerialists both know their suspended rope solos much better. The speaking parts are stronger. So, overall, it's more dynamic and a really good piece."